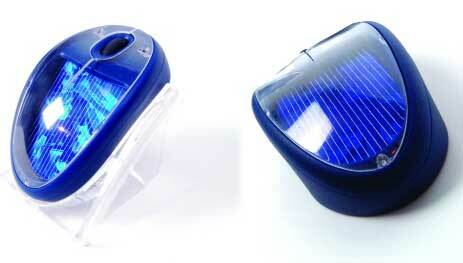 Solar Powered Wireless Mouse | OhGizmo! When it comes down to it, everything we use is solar powered. You know, your computer mouse gets power from electricity which comes from a power plant which is probably burning fossil fuel comprised of carbon fixed by long dead organisms which drew their energy from the sun. The solar powered Sole Mio mouse cuts out all the middlemen and lets the sun power your mouse directly, which has gotta be way more efficient than the process described in the preceding run-on sentence. The Sole Mio is being developed by the Netherlands Organization for Scientific Research. In fact, they’ve been working on this thing for over four years, and it’s not even available yet: it first has to undergo feasibility trials to determine whether the current configuration will generate enough power during the day to keep working, which is a lot more forethought than most products get before they hit the market. The mouse uses 20mA of electricity while active, can store 300mAh onboard, and can charge at a rate of up to 250 mA in full sunlight. It remains to be seen whether the mouse can be functional for average users on a day to day basis, but the developers estimate that the Sole Mio has the potential to save several hundred million batteries annually on a global scale. Uhm… Where do I put my hand since the solar cells that charge it are where I expect to put it? Jeez… Are you people stupid? You have covered the mouse with your hand the whole day?? You put your hand inside the mouse with the panels on top.